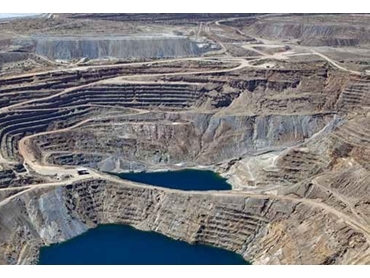 Airflex clutches from Eaton Hydraulics Group Australasia are ready to support full-swing production when an Arizona copper mine is reopened at the end of 2012. Eaton designed and produced drop-in clutch replacements to help restart operations at the copper mine. Closed since 2009 due to the global economic downturn, the mine will produce copper concentrate to serve the global economy. The Airflex clutches were supplied to the mine by Palmer Johnson Power Systems, an Eaton distributor in Phoenix, Arizona. Eaton Airflex Ventilated Constricting (VC) clutches transmit the rotary torque from 4,000 HP low-speed synchronous motors, which operate six ball mills that grind the ore in preparation for copper extraction. The mine had been closed for several years, prior to its purchase by the current owner. The idle concentrator systems required restoration and repairs. Reconditioning competitive clutches on the grinding mills did not seem necessary until a clutch failure turned into a very lengthy and costly downtime event. Eaton and Palmer Johnson were called in to provide a solution for the clutch. Eaton’s Don Keck, global market development manager and Palmer Johnson representatives soon learned that the project was not a run-of-the-mill clutch installation. Keck explained that since the installation was a retrofit, they needed to build a highly reliable solution entirely around a competitive, tightly enclosed framework. While addressing overall clutch dimensions, horsepower and motor shaft locations in his project proposal, Keck highlighted how the mine would directly benefit from Eaton’s Airflex VC clutches. He explained that the Airflex Dual 52VC1200 clutch would achieve full engagement at a slower speed upon start-up than the previously used disc-style clutches, resulting in reduced power consumption and the elimination of heavy shock load that caused stress on multi-million-dollar motors and drive components. Keck also reinforced the fact that Eaton’s Airflex engineering team would work very quickly to design the new clutch retrofit units and provide a detailed project timeline. The mine officials decided to replace the worn-out disc clutch with an Airflex VC clutch, as well as the clutches on the other five ball mills before more untimely failures (causing downtime) occurred. The first of the mills was restarted in four days after the Airflex clutch was delivered, with the remaining clutch conversions completed on time and within budget. In addition to designing and producing drop-in clutch replacements and delivering the complete retrofit packages in a very timely manner, Eaton also provided qualified field service support to oversee and manage the installation of the first clutch, as well as start-up assistance on completion of the installation.